Much like the rest of the United State, we have two types of midwives working in our state, nurse midwives and direct entry midwives. MS Friends of Midwives is focused primarily on direct entry midwifery. Though, we are supportive of both types of midwives and wish to see an increase in midwifery practice. More and more women in Mississippi are choosing home birth and they are being cared for by direct entry midwives (DEMs). See the chart (below, right) of the number of "Midwife Attended Births in Mississippi" according to Mississippi Vital Statistics. Under current law, any one in Mississippi can claim to be a midwife and practice midwifery. 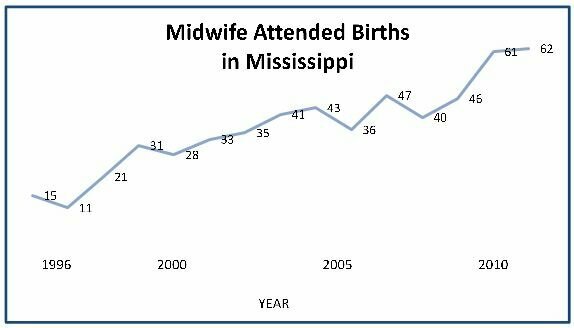 Mississippi has midwives practicing in all regions of our state and their experience, education and expertise varies greatly. Because of the lack of public protection policy, midwives who lost their right to practice midwifery in other states are free to come to our state to provide prenatal and maternal services. There has been and continues to be a lobbying effort to drastically restrict midwifery in MS. Learn more about the heated political battle to protect midwifery here. Certified Nurse Midwives (CNMs) are Registered Nurses who have continued their education to specialize in nurse midwifery. The vast majority of CNMs have no training or experience attending out of hospital birth. We have several CNMs in the state.They work closely with Obstetricians, deliver babies in hospitals and required to work under a physician in MS. In many other states, CNMs have more autonomy from physicians and are able to care for women planning a home birth. MS Friends of Midwives agrees that MS families could benefit from improving regulations for CNMs. However, this is not our primary focus. Mississippi has a rich history of midwives and midwife attended homebirths. According to the book Mississippi Women: Their Histories, Their Lives, "As late as 1947, 58% of Mississippi babies were born at home." In 1921, Laurie Jean Reid, a nurse with the United States Public Health Service came to Mississippi to survey the midwives of the state. Reid traveled around the 82 counties of Mississippi and identified over 4,000 midwives. An additional 1,000 midwives were identified a few years later. to 2004, the percentage of U.S. births that occurred at home increased by 29%, from 0.56% of births in 2004 to 0.72% in 2009. How do you explain to someone that has never held their newborn immediately after the birth the importance of continuity of care that a midwife gives? How do you recapture those first minutes of family life? Holistic care provided by a skilled, competent midwife is a process most people know little to nothing about. It is so different from the routine care the general public receives in a hurried medical environment. It is knowing, personally, your caregiver. A Certified Professional Midwife knows how to care for a healthy, well-educated, low risk expectant Mother. She knows how to assess for complications and how to manage them or refer them to a specific care provider outside of her practice. She knows how to guide the Mother and Family through pregnancy, birth, and the period after the birth. All of this to accomplish, not a routine birth, but the birth the Mother desired to have; respecting the Family’s rights, wishes, and plans while providing thorough, competent, considerate care. Midwives are still a respected caregiver all across the globe for the expectant Mother. American families are returning to the traditional caregiver for their maternity care once again.